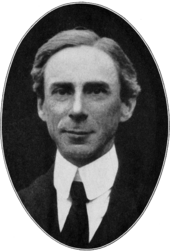 Russell's teapot, sometimes called the celestial teapot or cosmic teapot, is an analogy, coined by the philosopher Bertrand Russell (1872–1970), to illustrate that the philosophic burden of proof lies upon a person making scientifically unfalsifiable claims, rather than shifting the burden of disproof to others. Russell specifically applied his analogy in the context of religion. He wrote that if he were to assert, without offering proof, that a teapot orbits the Sun somewhere in space between the Earth and Mars, he could not expect anyone to believe him solely because his assertion could not be proven wrong. Russell's teapot is still invoked in discussions concerning the existence of God, and in various other contexts. Other thinkers have posited similar analogies. For example, J. B. Bury notes the following in his 1913 book, History of Freedom of Thought. Chemist Peter Atkins said that the point of Russell's teapot is that there is no burden on anyone to disprove assertions. Occam's razor suggests that the simpler theory with fewer assertions (e.g. a universe with no supernatural beings) should be the starting point in the discussion rather than the more complex theory. Atkins notes that this argument does not appeal to the religious because, unlike scientific evidence, religious evidence is said to be experienced through personal revelation that cannot be conveyed or objectively verified. In his books A Devil's Chaplain (2003) and The God Delusion (2006), ethologist Richard Dawkins used the teapot as an analogy of an argument against what he termed "agnostic conciliation", a policy of intellectual appeasement that allows for philosophical domains that concern exclusively religious matters. Science has no way of establishing the existence or non-existence of a god. Therefore, according to the agnostic conciliator, because it is a matter of individual taste, belief and disbelief in a supreme being are deserving of equal respect and attention. Dawkins presents the teapot as a reductio ad absurdum of this position: if agnosticism demands giving equal respect to the belief and disbelief in a supreme being, then it must also give equal respect to belief in an orbiting teapot, since the existence of an orbiting teapot is just as plausible scientifically as the existence of a supreme being. Clearly we have a great deal of evidence against teapotism. For example, as far as we know, the only way a teapot could have gotten into orbit around the sun would be if some country with sufficiently developed space-shot capabilities had shot this pot into orbit. No country with such capabilities is sufficiently frivolous to waste its resources by trying to send a teapot into orbit. Furthermore, if some country had done so, it would have been all over the news; we would certainly have heard about it. But we haven’t. And so on. There is plenty of evidence against teapotism. The concept of Russell's teapot has been extrapolated into more explicitly religion-parodying forms such as the Invisible Pink Unicorn and the Flying Spaghetti Monster. 1960s musician and psychedelic poet Daevid Allen created his Planet Gong Universe and the Flying Teapot Trilogy around the idea of a Flying Teapot and refers to Russell's Teapot in his book Gong Dreaming. ↑ Garvey, Brian (2010). "Absence of evidence, evidence of absence, and the atheist's teapot" (PDF). Ars Disputandi. 10: 9–22. doi:10.1080/15665399.2010.10820011. ↑ Bury, J. B. (1913). History of Freedom of Thought. London: Williams & Norgate. p. 20. ↑ Dawkins, Richard (2003). A Devil's Chaplain. Houghton Mifflin. ISBN 0-618-33540-4. 1 2 Dawkins, Richard (2006). The God Delusion. Houghton Mifflin. ISBN 0-618-68000-4. ↑ Wolf, Gary (14 November 2006). "The Church of the Non-Believers". Wired News.